Next meeting is to be held on Thursday, 27th May. This is a Board Meeting & Directors are asked to get reports to Secretary Heather asap so that they may be included in the agenda. In June 2016, fifty years after spending his year as RC Rochester’s first Exchange student, Akira Tajima returned to the town to introduce son Kenji & daughter Tomoko to his classmates of 65-66. Over the years Akira has made several visits to Rochester & has been visited in Tokyo by school friends & Host family members. 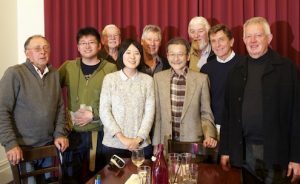 Akira’s exchange was during a time when there was still evidence of anti-Japanese feeling in the Australian community and at a time when the majority of Rotarians were Ex- Servicemen, some of whom had survived the horrors of POW Camps. Along with lasting friendships, it has been said that Akira’s participation in Rotary Youth Exchange brought with it not only a greater understanding of another culture but contributed to a community’s healing. As Akira continues treatment for an aggressive cancer, we wish him well. Funding for the 2nd bridge that required the co-operation of two State Governments and the Federal Government. Funding to improve Court Services and the safety of participants. Train Services – upgrading of the line & the increase in services. Telecommunications – the elimination of black spots. Water and the challenges imposed by The Murray Darling Basin Plan that requires four State Governments and the Federal Government to all agree to any changes. Recent studies have shown that $500,000 has been lost to the local area due to the loss of water under the MDBP. Leigh also spoke of the Council’s role in the Port of Echuca and the subsidies given to tourism. In concluding, Leigh also spoke of possible outcomes to the Murray Goulburn closure. Thank you Leigh for a very interesting talk and discussion.